Inspired by Justin Carter‘s Blood from Stone exhibition, artist and Associate Educator Jessica Harby led an ink workshop for Irthlingborough Infant and Junior schools at The Arches. Pupils learned a bit of science while taking part in creative experimentation. They began with a tour of Justin Carter’s Blood from Stone exhibition at The Arches, enthusiastically calling out what the inkblot prints resembled. The pupils saw insects, slippers, skeletons, space ships, faces, and a baby in the ink, but agreed that there was no correct answer. Then on to Justin’s display of studio detritus, which reveals his process of making iron gall ink from materials sourced in the Rockingham Forest area. Jessica had come prepared with natural inks made from kitchen ingredients, including turmeric, beetroot, and tea, in addition to a jar of grass ink. After guessing the ingredients using their sense of smell, pupils participated in ink fights between natural and manufactured drawing inks, dropping the inks onto wet paper to see them interact. 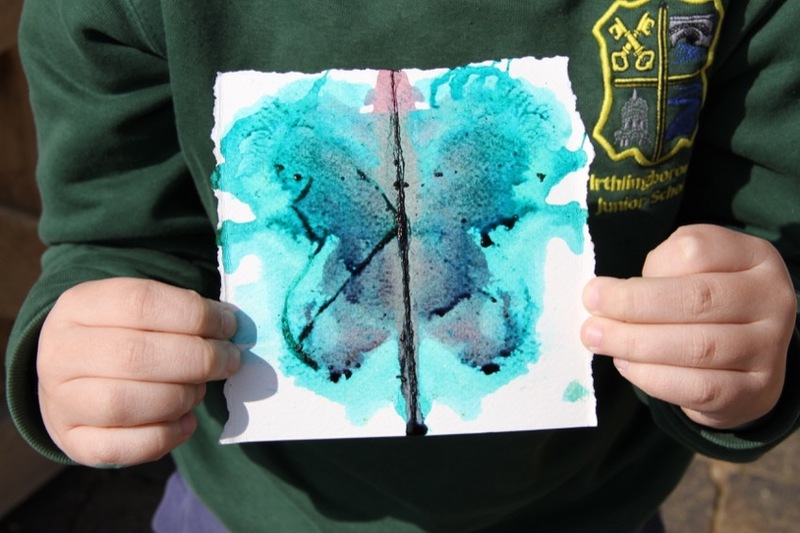 This was very exciting for the group, and led perfectly into making their own inkblots and experiments. As well as pipettes, Jessica distributed old fashioned drawing nibs, sea sponges, brushes and spray bottles. 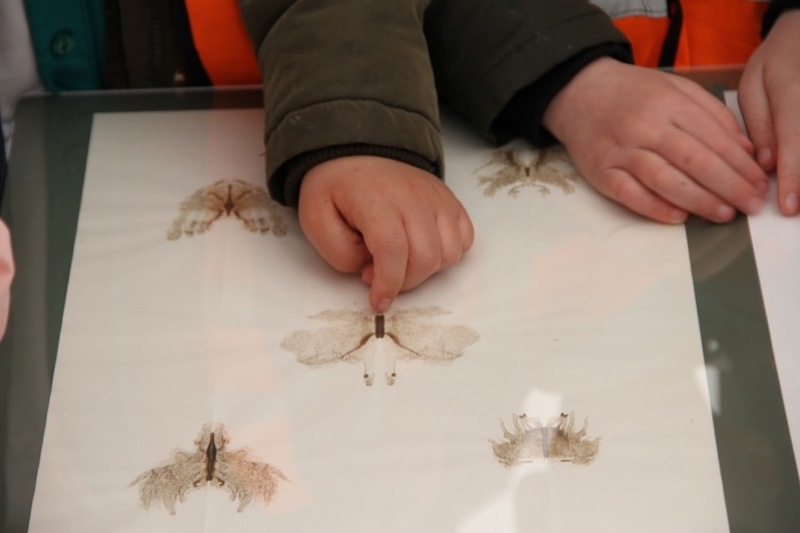 Allowed to experiment, the children intuited many techniques without having to be shown, including pressing dry paper onto a still-wet composition to make a mono print, blowing on the ink to direct its course on the page, and producing small dots of colour by flinging ink from a brush above the paper. Fermynwoods gratefully acknowledges the support of The Finnis Scott Foundation in supporting Blood from Stone. To learn more about our education programme please, click here. This entry was posted in Education, News and tagged Fineshade Wood, Jessica Harby, Justin Carter, The Arches. Bookmark the permalink.